Are you out of time and strapped for cash? Applying for a bank loan can be a frustrating and time-consuming process. A bank loan can take days, even weeks to be processed before you know if you’re even approved or not. Also, banks require good credit history before providing a loan. Many people often face financial problems and are in need of instant cash. These include overdue bills, medical expenses, education expenses or other unexpected expenses. If you’re in a situation where you need cash in a hurry then a car pawn loan is the solution for you! If you own a vehicle, Canadian Title Store can help you get approved for a loan! It’s Easier To Pawn Your Car Than You Think! ● You must have a valid Canadian driver’s license. ● Must provide the second set of keys to your vehicle. Need Cash Fast? Get It Now! We lend up to $60,000 based on your vehicle’s market value and condition! We offer the lowest interest rates in the industry. There are no prepayment penalties so you can easily make early payments or pay your loan off earlier than expected. You can borrow up to $60,000 today depending on the fair market value and condition of your vehicle. Our loan experts will determine the value of your vehicle by considering certain factors such as your vehicle’s make, year, model, mileage, and engine condition. Get the cash you need quickly to solve all your financial difficulties. One of the benefits you get when you pawn your car for cash is a speedy process. You do not have to wait in long lines to get your loan with us. Get your cash the same day! Because we don’t need to look into your credit history, check your credit score, or require you to submit any bank statements, our well-trained and highly-experienced agents can process your documents, approve your loan, and give you the money the same day! Another perk is our no credit check feature. We do not look into your past financial history! Your vehicle serves as collateral for the money you need. 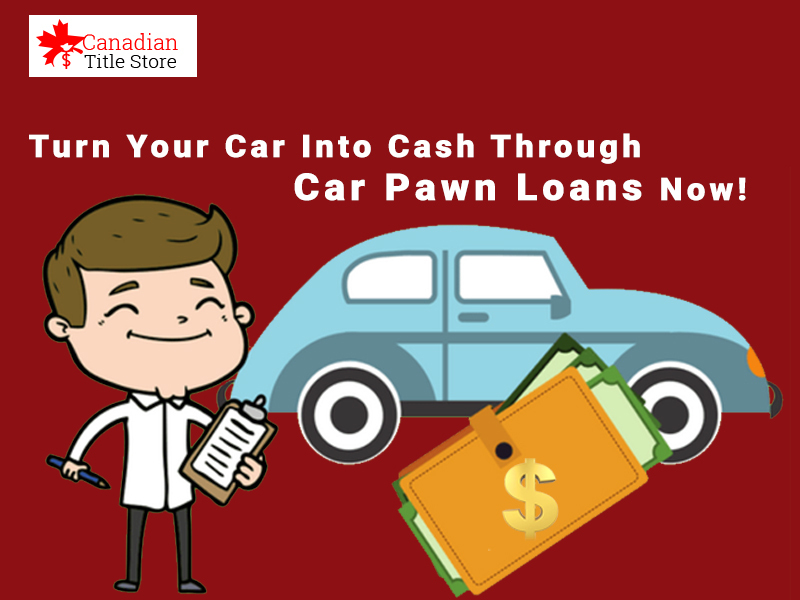 There are no hidden fees when you choose to get car pawn loan with Canadian Title Store. We understand that your vehicle is important for your daily routine. Therefore, we allow you to keep your vehicle during the entire loan term while making payments. Don’t have a job or recently lost your job? No problem! 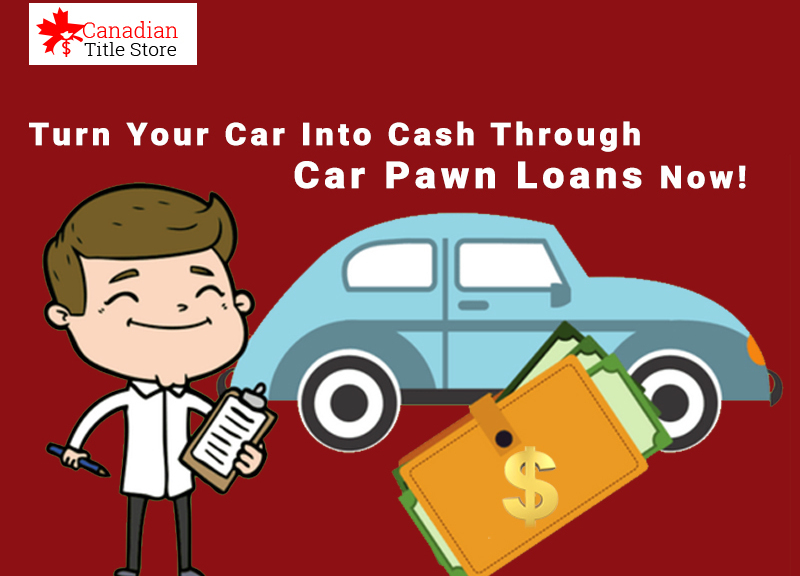 You can still apply for a car pawn with Canadian Title Store! ● Vehicle must be registered and insured in your name. ● The second set of keys to your car. ● Provide proof of permanent residence. Get the cash you need in just a few easy steps! Call us (toll-free) 1-844-512-5840 or fill out our online application form. We require minimal documents to approve your loan. After submitting your documents, you can get your cash as early as the same day and simply drive away! One of our representatives will be in contact after you complete the application. So, solve your financial problems today by calling us now (toll- free) 1-844-512-5840 or by applying online. We believe you deserve to get the money you need quickly and safely!.